After briefly attending the University of Michigan and Olivet College, McGuane thrived academically at Michigan State University, where he received a B.A. in English in 1962 and met his lifelong friend Jim Harrison. At the Yale School of Drama (M.F.A., 1965), he studied playwriting and dramatic literature. A Wallace Stegner Fellowship to Stanford University (1966–67) provided him the time and resources to finish his first published novel, The Sporting Club, published with Harrison's help in 1969. The Sporting Club is an anarchic portrayal of aristocratic decline and eventual ruin at an elite Michigan outdoor club.McGuane wrote the novel in a frenetic six weeks after his initial hopes for a published novel in The Dial were dashed by its editor at the time, E. L. Doctorow. Upon completing his Stegner Fellowship, McGuane and his wife, Rebecca Portia Crockett (a direct descendant of Davy Crockett), began to divide their time between Livingston, Montana, and Key West, Florida. When the screen rights to The Sporting Club were purchased, he invested the funds in ranch property in Montana's Paradise Valley. His second novel, The Bushwhacked Piano, a picaresque comedy chronicling the romantic, sporting, and entrepreneurial hijinks of Nicholas Payne, traipsing from Michigan to Montana to Florida and sprinkled with wry commentary on the current state of America, appeared in 1971 to rave reviews. Jonathan Yardley in the New York Times called the 31-year-old McGuane “a talent of Faulknerian potential,” while Saul Bellow described McGuane as “a language star.” The novel won the Rosenthal Award of the American Academy and Institute of Arts and Letters. McGuane's third novel, Ninety-Two in the Shade (1973), was received as continued confirmation of his potential and is perhaps his best known, or at least his most widely acclaimed in literary circles. Shoving off with the ominous invocation, “Nobody knows, from sea to shining sea, why we are having all this trouble with our republic,” the novel uses young Thomas Skelton's desire to be a Key West fishing guide as a foil for expressions of word-drunk cultural, familial, and macho angst, culminating in Skelton's death at the business end of rival guide Nichol Dance's pistol. 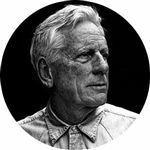 Ninety-Two in the Shade was nominated for a National Book Award, and represents the close of the first chapter in McGuane's public literary life, a closing that may have also coincided with the crash of his Porsche on an icy Texas highway. The crash left him without serious injury but speechless for several days, and he resolved to shed his monastic obsession with writing novels and to assume a new lease on life, a resolution substantially assisted by Hollywood's offering of lucrative screenwriting opportunities. Thus began the interlude in McGuane's career when he became known as “Captain Berserko” and wrote screenplays for Rancho Deluxe (1973), shot in Livingston; The Missouri Breaks (1976), directed by Arthur Penn and starring Jack Nicholson and Marlon Brando; and McGuane's own foray into directing with a film adaptation of 92 in the Shade (1975), starring Peter Fonda, Warren Oates, Margot Kidder and Harry Dean Stanton. McGuane has received and been nominated for many awards. He won the 2016 Robert Kirsch Award for lifetime achievement from the Los Angeles Times, was a finalist for the National Magazine Award in 2013 for his story "River Camp," and was a finalist for the Frank O'Connor Award in 2015.